It seems rather odd that anyone would name a beach club after an ancient Mesopotamian demon, much less one that kicked off Linda Blair’s head-turning possessed escapades in the 1973 horror classic ‘The Exorcist’. And yet, the newly opened Pazuzu was apparently named after the Greek mixed media artist Roberto Cuoghi’s giant statue of Pazuzu. Thankfully, there is nothing demonic about the low-slung beach club and restaurant. Located about 16 km west of Corfu Town along Glyfada, one of Corfu’s prettiest stretches of soft-sanded beaches, the project is designed by Thessaloniki-based LoT Office for Architecture (which just opened an office in New York) in association with Athens-based architect Panagiotis Sarlis, and New York - and Athens - based lighting designers m.a.P. Studio and Artemis Papadatou. 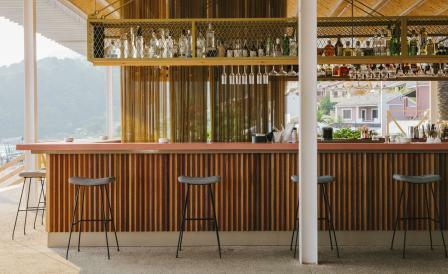 Capped with a geometric perforated roof that lets in striated light while offering relief from the worst of Corfu’s summer heat, Pazuzu’s airy interiors give out to views of the dappled blue sea, tree-covered cliffs and looming rocks. A perforated metal curtain divides the space neatly into restaurant and club. By day, chef Panagiotis Tsirgiotis serves up lobster linguini and Black Angus mini-burgers. Come sunset, the evening begins with mai-tais at the 12m-long bar and then segues into deep and tech house spins.